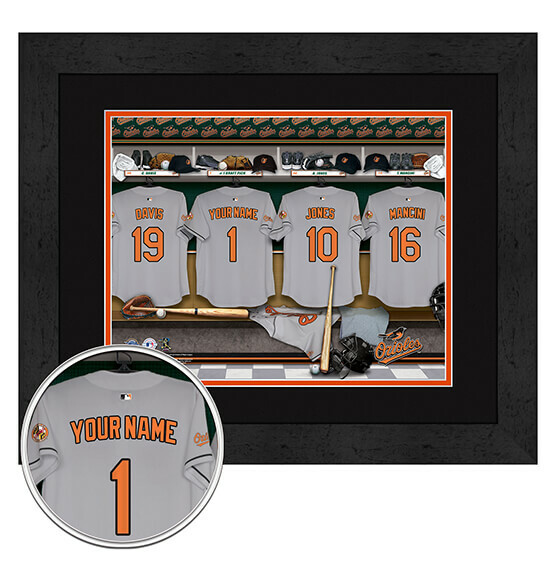 With its high-quality digital double mat featuring Baltimore Orioles team colors, elegantly finished black frame and vibrant print colors protected by glass, our personalized O's Locker Room Framed Wall Art is guaranteed to be a conversation starter. Easily customize this fine sports decor by specifying what name you would like on the back of the jersey — up to 12 characters. We'll take care of the rest! Purchase this MLB Baltimore Oriole personalized artwork for a fantastic, out-of-the-ordinary gift for friends, family and co-workers. (Or purchase it for yourself — we completely understand!) This high-quality print arrives ready to hang with a sawtooth hanger.